With powerful media handling and innovative smart features to ensure a high level of data integrity, the WorkForce DS-530N is geared towards highly-efficient and simple integration into an organisation’s workflow. With a 50-page ADF and the ability to scan at up to 35ppm/70ipm, it offers a wide range of media handling options that enable you to rapidly capture, index, store and share business documents. •Auto Scan Mode - Quickly process physical documents in manageable amounts. •Network Sharing - Integrate this network-ready model with push scan and pre-defined job profiles. 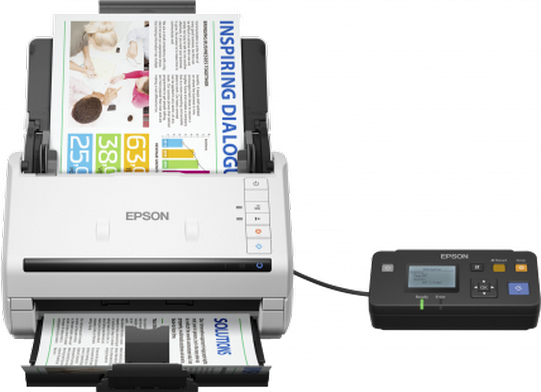 Single-pass double-sided scanning ensures rapid document processing, while it's possible to scan a versatile array of media such as paper as thin as 27gsm, or thick card at 413gsm. The A3 carrier sheet speeds up the process by automatically stitching larger documents back together digitally.